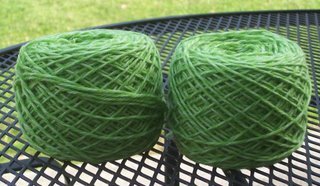 I love yarn, especially the color. It reminds me of all the possibilities a box of Crayolas has! Too bad the only things limiting me are my imagination and lack of skill. Mine turned out like this! I modified it a little to have a bigger main compartment and widened the strap by 2 rows. I still need to block, sew on the snaps and locate a suitable buckle. 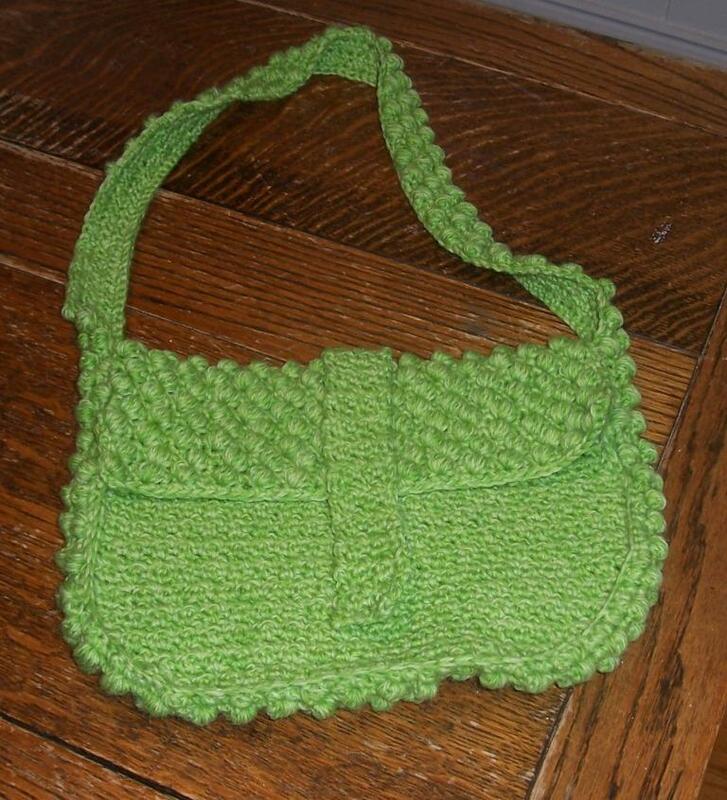 It reminds me of peas and I have dubbed it my "Sweet Pea Purse." Since Brooke and Ann think yarn purchases for a class are ok then perhpas now I can shed myself of the guilt of the purchase! Here is project #4. 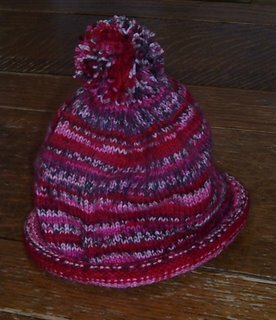 It's a hat for my SIL's birthday next week. 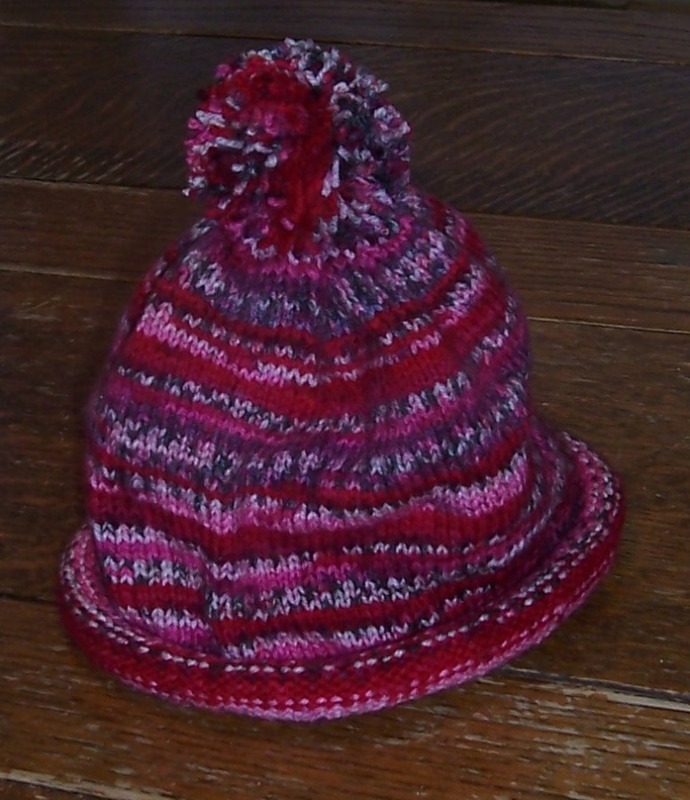 It was made from Moda Dea's Sassy Stripes in the Crush colorway. 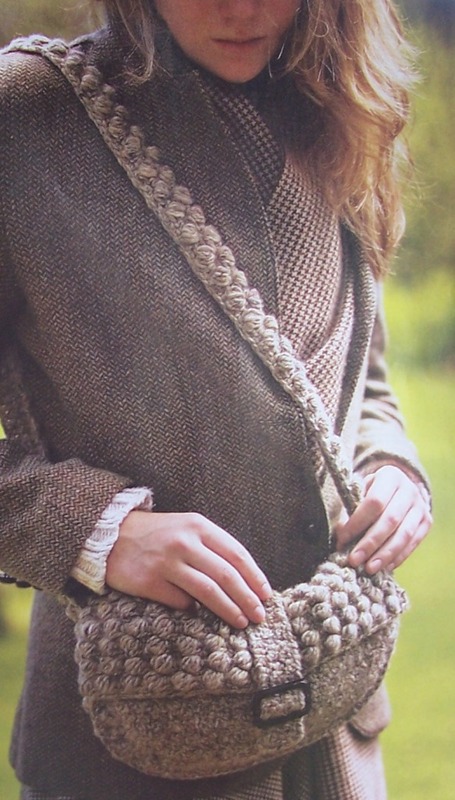 I am a little concerned that it will be small but it fit Mr. Knotty so I guess it will be ok. I beleive I made the guage a little tight and therefore it may not have quite the stretch I was hoping for! I still have to make a quick scarf that will NOT be knit on 3's!! I'm feeling a 5 or a 6 coming on! Here is project #2! 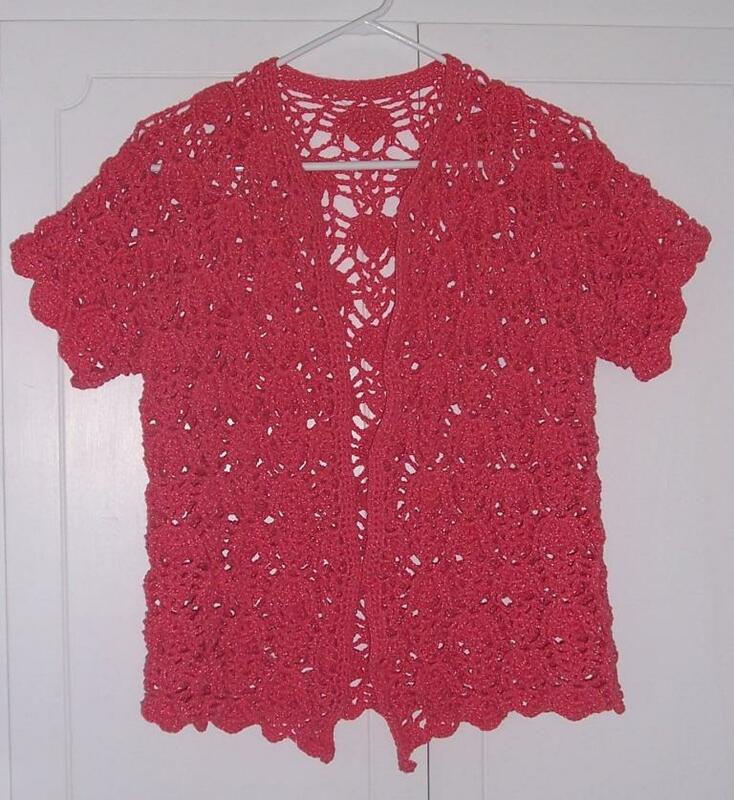 This was the bolero featured in a previous blog. I will model it one day so you can see how lovely it is. It somehow loses it's charm on the hanger. 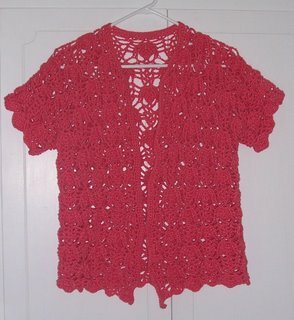 I made this from an Evita yarn in watermelon. I am looking forward to wearing it. The open lace-type work is much prettier than the pictures lets on. I'm so glad you modified the bag pattern to be bigger; who could carry such a tiny bag in everyday life?! 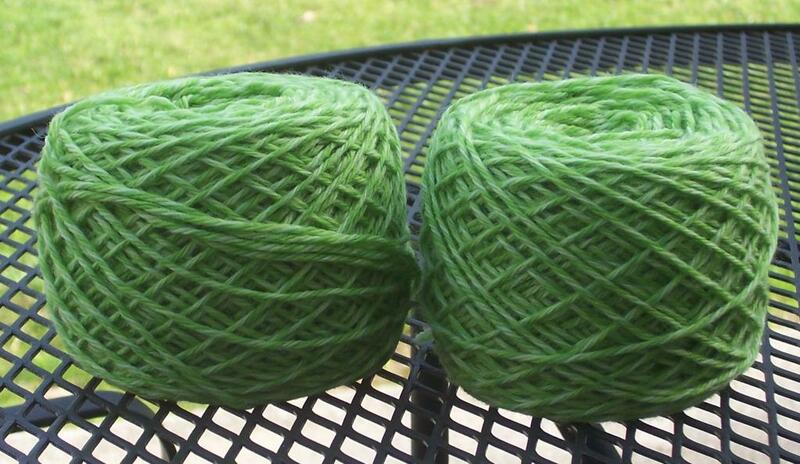 The yarn turned out beautifully. I bet the hat will stretch the more she wears it. It's going to be an awfully cute set. And the bolero- the bolero! I love it. So if we stashalong can that include spinning fiber, of which I have too much?